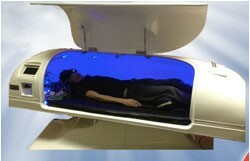 The Theta Chamber consists of multiple therapies combined to help induce a Theta brainwave state. Theta is a state where tasks become so automatic that you can disengage from them. If you have ever performed a routine task and then do not remember doing it, you were probably in a Theta state at the time. It is a very positive state, and also a very creative state. During the Theta state, certain therapies can help to re-establish normal neural pathways and normal levels of serotonin, dopamine and other neurotransmitters. There are five therapies involved in a Theta Chamber session: FDA approved CES (Cranial Electrotherapy Stimulation), Binaural Audio Beats, Visual Pattern Light Stimulation, Vestibular (motion) Stimulation and Audio Relaxation Tracks. A session lasts 30 minutes, and is tailored for each person’s individual needs, using specific frequencies for specific conditions/illnesses. The Theta Chamber can help with all types of addiction, depression, PTSD, anxiety, insomnia, weight loss and so much more. We have patients report migraines disappearing, a surge of creativity and a sense of peace and calm as well as other positive changes after their very first session in the chamber. For more information and for a short, educational video, go to Theta Wellness Center.